Indian voters have just handed Narendra Modi their most decisive mandate in 30 years. The opposition politician’s landslide win ends a tortuous era of coalition politics that has stymied policymaking. It also offers India a way out of its current limbo. Though all the votes have not yet been counted, Modi’s Bharatiya Janata Party is on track to capture a few more seats than the 272 it needs for a simple majority in the lower house of parliament. No single party has managed to do that since 1984, when Rajiv Gandhi won a landslide victory following his mother Indira’s assassination. The BJP-led coalition’s tally will likely cross 325. Investors, who pushed up Indian stocks more than 1 percent on the news, have reason to cheer. The scale of the pro-business politician’s victory, which was predicted by just one exit poll out of seven, removes any doubts about the stability of the government. It is highly likely to last its full five-year term. Knowing this, it is extremely improbable that Modi will let pesky coalition partners undermine major policy decisions. Besides, Modi won’t need to curry favour with allies by distributing ministerial jobs. This means his cabinet will be small and tightly knit – with the prime minister’s office in control of economic policy. Bureaucrats, too, will tread with caution, and think twice before doing major harm, like the retrospective change to India’s tax code they introduced in the 2012 budget. Legislative change remains a challenge, though. Modi’s party won’t control the upper house. Crucial bills, such as one that could pave the way for a much-needed nationwide goods and services tax, will require the new prime minister to work with opposition parties. But it’s far from clear that Sonia Gandhi’s Congress Party, nursing its worst-ever electoral defeat, will be keen to let Modi score too many parliamentary successes. A big mandate also means great expectations, and the risk of early disillusionment. Three decades ago, Rajiv Gandhi’s popular support vanished very quickly once he got embroiled in a defence-purchase kickback scam. Five years later, he was out of power. To avoid a similar fate, Modi will need to pay as much attention to what he doesn’t do as what he does. 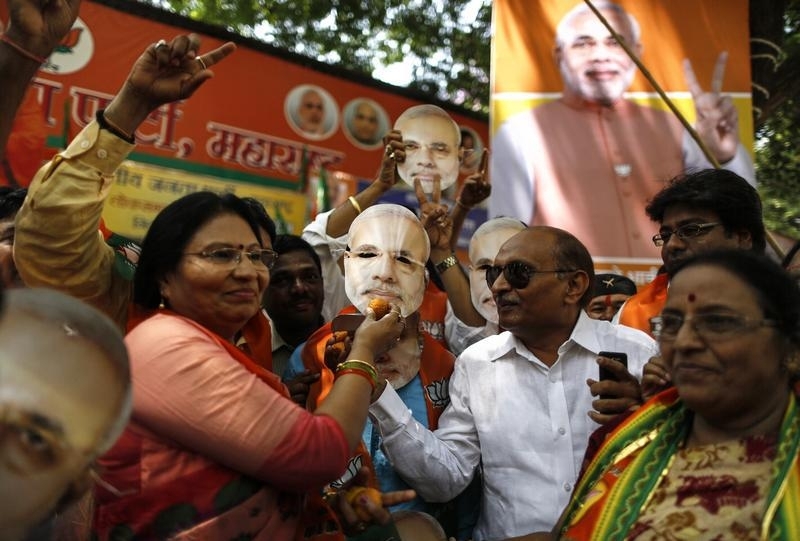 Supporters of the Bharatiya Janata Party (BJP) hold up a mask of opposition candidate Narendra Modi, as they celebrate after learning of initial poll results outside their party office in Mumbai May 16, 2014. Indian opposition leader Narendra Modi’s National Democratic Alliance was leading in 327 out of 543 seats in India’s lower house of parliament, according to data from the Election Commission at 1:52 p.m. (0832 GMT) on May 16. Modi’s own Bharatiya Janata Party was on track to win 281 seats, ahead of the 272 required for a majority. Counting of votes began at 8 a.m. Indian time. “Trends indicate it is a landslide,” said party president Rajnath Singh in a message on Twitter. On current trends, the Congress Party-led United Progressive Alliance, which has ruled the country for the last 10 years, may win just 68 seats. The Congress Party, headed by Sonia Gandhi, may post its worst-ever electoral performance, winning just 51 seats. By early afternoon in India, the Indian Rupee strengthened to 58.98 against the dollar. The CNX Nifty Index was trading at 7210, up 1.3 percent.